Look for companies with high cash flow, fast growth and overseas sales, fund manager Jim Meyer says. BOSTON (TheStreet) -- Cisco Systems (CSCO - Get Report), General Electric (GE - Get Report) and Hewlett-Packard (HPQ - Get Report) are poised to outperform if the U.S. economy continues to grow at a weak pace, says Jim Meyer, chief investment officer of Tower Bridge Advisors. U.S. companies with consistently high free cash flow, earnings growth that outpaces the economy and substantial international sales are Meyer's three main criteria. West Conshohocken, Pa.-based Tower Bridge Advisors, which has $850 million in assets under management, manages accounts based on that trading strategy. The benefits of free cash flow, namely potentially higher dividends and stock buybacks, will account for a larger chunk of investor returns if the U.S. economy grows at a slower pace, which economists expect. As a result, investors will be lured by companies that tap into growth outside the U.S., particularly in emerging markets. 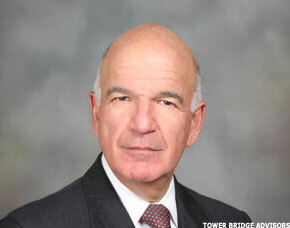 Jim Meyer, chief investment officer of Tower Bridge Advisors. "As a company's growth rate slows and it spends less money, cash flow really spikes," Meyer says. "Historically, we've been moving away from dividends and stock repurchases. But as the economics change and cash builds, it makes very little sense to keep it." Meyer says there's close to $2 trillion on corporate balance sheets "making nothing," particularly with bond yields near record lows. The solution, Meyer says, is that companies will begin to aggressively buy back stock or increase dividend payments. "Dividends look especially attractive today in a world where competing interest rates are so low. You have many blue chip stocks with dividend yields that exceed their 10-year bond yields, which is pretty perverse." Investing in companies with high free cash flow isn't a sure thing. That's why Meyer looks at companies that can grow at twice the rate of gross domestic product, or GDP. For him, a growth company can propel earnings by at least 10%. International investing is important, Meyer says, especially as about 30% of the world's population lives in only two countries, China and India. The U.S. economy may post growth of about 2% to 2.5%, less than the historical average of 3.5% to 4.5%, he notes. International growth probably will be almost double that, he says, citing International Monetary figures. Still, U.S. stocks have recorded outsized gains this month, with the Dow rising 8.2% and the S&P 500 climbing 9.1%, in line with one of the hottest emerging markets, Brazil, whose Bovespa Index has increased 9.6%. If U.S. shares extend those gains, "you'd want the highest beta stocks you could buy," says Meyer, referring to stocks that closely track indices. The likelihood that the U.S. indices could continue this breakneck pace of gains is slim, Meyer asserts. When the slow-growth fears creep in again, seeking out stocks with cash flow, earnings growth and international exposure will serve investors well, he says. Meyer says the following five stocks owned by accounts managed by Tower Bridge Advisors meet his criteria. Company Profile: Teva Pharmaceutical is a global pharmaceutical company that develops generic drugs. Teva's multiple-sclerosis drug, Copaxone, had second-quarter global sales of $773 million, up 13% from the second quarter of 2009. Meyer's Take: "It's the best at what it does. It's clearly international. Rising middle classes around the world are going to be bigger users of drugs because they can afford to. That's a worldwide phenomenon. The patent-expiration calendar will be a big help to them. The only issue for them is that their one drug, Copaxone, faces questions about how long the patent will survive and what competitive drugs may emerge. Those worries are overplayed, which provided an opportunity to buy into what I think is the best drug company out there today. The FDA takes so long to approve drugs today out of safety concerns, which means that a much higher percentage of drugs in the world will be generics. If the market share is going to move in the favor of generics, why not go to the best generics company out there?" Analyst Consensus: Teva garners 18 "buy" ratings from analysts covering the stock. The other two research shops with coverage of Teva have a "hold" rating on the shares. Company Profile: Cisco sells networking gear and also provides communications services. Current Dividend Yield: Cisco doesn't currently pay a dividend, although the company said it will begin paying one this fiscal year. "Size and timing of the dividend will be determined in the coming months, taking into consideration tax policy and broader market conditions," Cisco said earlier this month. Cash and Cash Equivalents: $4.58 billion, along with about $35 billion in short-term investments. Meyer's Take: "This fits into all three themes. Cisco is a growth company, as it can achieve earnings growth in excess of 10%. They clearly are a free cash flow company. They may have more cash on their balance sheet than any company out there. Cisco is also global; it does business all over the world, with a significant amount overseas and in emerging markets. This company was born in an era when dividends were anathema. It was an admission that you couldn't grow anymore. But Cisco and other tech companies are increasingly understanding that dividends are a bigger component. At some point, cash needs to be returned." Analyst Consensus: Thirty-four analysts follow Cisco, making it one of the most widely covered stocks on Wall Street. Twenty-five firms have "buy" ratings on Cisco, and another eight have a "hold." One analyst suggests that investors sell the shares. Company Profile: General Electric sells aircraft engines, power-generation equipment, household appliances and medical-imaging equipment. It also has a finance arm. Current Dividend Yield: 2.9%. In July, GE raised its dividend by 20% to 12 cents per share from 10 cents, citing continued strong cash generation, a recovery at finance unit GE Capital and "solid underlying performance in our industrial businesses through the first half." GE, in a rare move, slashed its quarterly dividend payment, from 31 cents per share to 10 cents, in February 2009 to save $9 billion annually. Meyer's Take: "They're a long way from bringing the dividend back to where it was, but I think they're committed to moving in that direction. GE CEO Jeffrey Immelt does understand the role of dividends to shareholders. The problem with GE is that the company for a long time was riding the back of GE Capital. They were able to manage the earnings by strategically selling off assets in their real estate portfolio, which had embedded capital gains. They would realize those gains and smooth out their earnings. With real estate values down, they can't do that anymore, so the profitability of GE Capital is quite a bit less. But on the other hand, the industrials side and the rest of the business have some pretty exciting prospects. The alternative-energy business, which includes turbines, offers tremendous long-term potential. GE ought to be able to get back to or above normal growth rates. They have cash flow and tremendous international presence. It might grow faster than GDP worldwide, although not by much." Analyst Consensus: GE is followed by 16 analysts, nine of whom have "buy" calls. The other seven recommend investors hold the shares. Company Profile: Colgate-Palmolive makes a number of products in the U.S. and around the world in oral, personal and home care as well as pet nutrition. Some consumer brands the company owns include Colgate toothpaste, Palmolive soap, Ajax, Mennen, Irish Spring and Dermassage. Meyer's Take: "Colgate has great cash flow. The play on Colgate is just its presence in emerging markets. When you go from lower class to middle class and you become employed in the traditional sense, then you want and need convenience products for a lot of reasons. The middle class may only be a couple hundred million people out of a billion, but a couple hundred million people is the biggest middle class of any country on this planet. When people say they want to own Chinese stocks, you should instead own Colgate. You'll have American governance. You may see generic copies but people still go out and buy the name brands. It's not that much more expensive, and people perceive it as better. These are huge markets that will allow Colgate to grow in double digits for many years to come. It will do massively well in these emerging markets." Analyst Consensus: Of the 23 research firms following Colgate-Palmolive, five recommend that investors buy the shares. The rest have a "hold" rating on the stock. Company Profile: Hewlett-Packard is a global computer maker. Meyer's Take: "HP has high cash flow and it's also in the same emerging markets as Cisco. It may grow a little faster than the economy, but HP's improvements of the last several years have been assimilating acquisitions rather than core internal growth. HP fits into the overlay of valuation. The stock has been slaughtered by what has happened with Mark Hurd. I would expect them to announce shortly that they'll announce a new CEO. HP needs new management, anyway, because the time has come for the company to stimulate the top line a little more. In terms of the Palm acquisition, it looks to be another dumb waste of money. They hope to take the tools from Palm and build something in the phone/tablet market that will make it worthwhile, but the jury is still out on that one." Analyst Consensus: Twenty-five analysts covering HP have a "buy" rating on the stock. Another six say investors should hold the shares, while one has a "sell" rating.